The NEGBINOM.DIST Function is categorized under Statistical functionsFunctionsList of the most important Excel functions for financial analysts. This cheat sheet covers 100s of functions that are critical to know as an Excel analyst. It will calculate the negative binomial distribution probability. It will get the probability mass function or the cumulative distribution function for a negative binomial distribution. For example, using the function, we can find out the probability that when a coin is tossed, we will get 10 heads before we get 12 tails. This guide will break down the Excel negative binomial distribution formula. For the negative binomial distribution, we will fix the number of successes but uses a variable number of trials. NEGBINOM.DIST will calculate the probability of a given number of failures occurring before a fixed number of successes. The Probability Mass Function – It calculates the probability of there being exactly “f” failures before “s” successes. The Cumulative Distribution Function – It calculates the probability of there being at most “f” failures before “s” successes. In financial analysisFinancial Analyst Job DescriptionSee a real Financial Analyst Job Description including all the skills, experience, and education required to be the successful candidate for the job. Perform financial forecasting, reporting, and operational metrics tracking, analyze financial data, create financial models, the NEGBINOM.DIST function can be useful in finding out the probability of getting x return from a stock or portfolio before getting a negative return. Number_f (required argument) – It is the number of failures that are encountered before number_s successes. Number_s (required argument) – It is the required number of successes. Probability_s (required argument) – It is the probability of successes in one trial. Cumulative (optional argument) – It specifies the type of negative binomial distribution to be calculated. It can either be TRUE (uses the cumulative distribution function) or FALSE (use the probability mass function). How to use the Negative Binomial Distribution Formula in Excel? The NEGBINOM.DIST function will truncate all numerical values to integers. The cumulative argument provided is not recognized as a numeric or a logical value. The number_f provided is less than 0 or the supplied number_s is greater than 1. The probability_s provided is less than 0 or greater than 1. 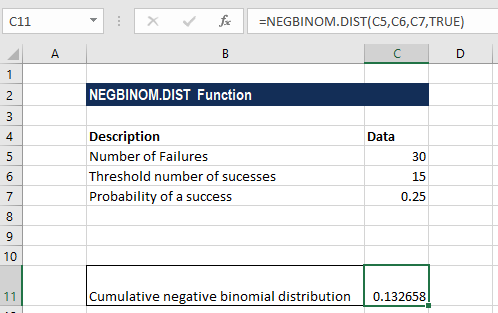 The NEGBINOM.DIST function was introduced in MS Excel 2010 and hence is unavailable in earlier versions. For older versions, we can use the NEGBINOMDIST function.